This brochure advertises travel between St. Louis/Chicago and Los Angeles/San Francisco via the Atchison, Topeka and Santa Fe Railroad. Included is a description and picture of the Pullman tourist sleepers, the dining cars and dining rooms, the weekly schedule from various locations and ticket rates. 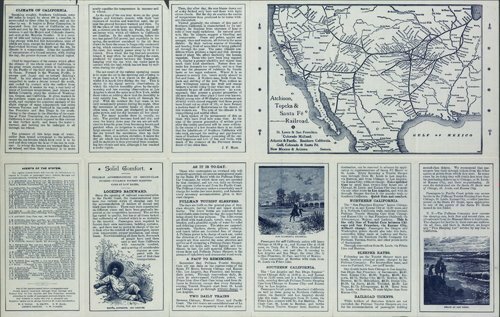 The brochure also has a map of the southwestern United States and northern Mexico showing the route of the Atchison, Topeka and Santa Fe Railroad and its various connections.